Being a fan myself, and this year being the 50th year since Deep Purple were formed, I decided I wanted to do something to mark the occasion and produce something to hand on my own study wall. So, for the last few months I’ve been working on a super huge family tree of band member connections with other major UK bands. It contains 50 different bands within it (I thought that was a nice number to reach for a 50th anniversary! ), with the core of it, of course, being Deep Purple members. 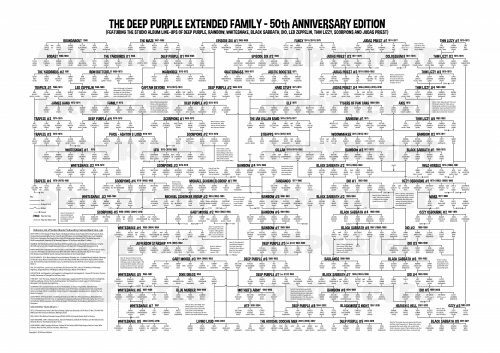 I’ve called it the Deep Purple Extended Family (as they are considered to be one of the catalyst for a lot of the rock bands that came after them). I’ve now completed the project, and a print of it is hanging proudly on my study wall. However, I’ve decided it would be a shame to keep the poster to myself, so I am sending a high definition converted JPEG copy of it to various parties out there that might be interested to have a look at, comment on, display on websites, etc, on a permission basis, whilst retaining copyright over hard copy prints. It’s been a complex and pretty frustrating project at times, which has taken a lot of effort to make it as accurate as possible. As the tree has got bigger, the options of branches that can be included get exponentially bigger (!) and so it becomes harder to decide what to include and leave out, as well as the connections between artists getting more complicated. So I have tried to include those branches and connections that seemed most relevant to me. I have also listed the poster on eBay (it can be found by searching Deep Purple Poster) in case people want to buy a large high quality printed copy. So, the only thing I have done to it to protect myself on the copy I am sending out digitally, is to add a faint copyright watermark, which does not detract from being able to view the detail of it online. On eBay I’ve restricted sales to the UK, mainly because I’m not sure what the postal cost to send to the USA would be. But if there was interest from over the pond there, I’m sure I could figure this out! Posted by Nick Soveiko on Monday, April 16th, 2018, filed under Blog. You can follow comment on this post through the RSS 2.0 feed. You can skip to the end and leave a comment. Pinging is currently not allowed. Cool , but don’t understand why the Yardbirds and Led Zep are there ? Hell of a lot a work! But … where is the connection to Led Zeppelin / Yardbirds? Oh, what a tangled web we weave… when first we plant the hard rock seed. Or something like that!. What do the parentheses mean? Example: Captain Beyond 1971 (1973) 1973? Also Cozy Powell played on one of Plant’s solo albums. Artic rooster?are they similar to atomic monkeys? It is a huge job to put together such a project. Kudos to Mr. Glenn Weiland for this excellent tree / forest / jungle. Deep Purple Mark II (1984) played an encore on stage in Australia with George Harrison. Ian Paice, and David Gilmour (guitarist PINK FLOYD) played with Paul McCartney on the Run Devil Run album 1999. Once again, excellent work by Glenn Weiland to put together such a massive project. These org charts are not easy to construct, and are contant works-in-progress as there is always new info that surfaces which requires a reconfiguring to accomodate newly revealed links. Also, additional links to the Yardbirds via Jeff Beck, as Cozy Powell played drums on a couple of the Jeff Beck Group albums in the early 70’s. Another interesting connection is to Joe Satriani. He was guitarist for Purple in 1993/94. And he also recently released a studio album What Happens Next with Glenn Hughes on bass. Hi, thanks for your comments, I’ll try and answer a few of them. Firstly a couple of catch all’s. Despite Paulo’s kind comment, there is so much rock music out there, it would be impossible to include everything, so sometimes something has to give (like Mathias and CC with his Cozy comment)! Secondly, the tree is very firmly Studio Album line-ups (mentioned in a few places) which can differ greatly to the line-ups that went out on the road. For me, this gave me a clear rule to follow when designing the tree. Onto specifics, a couple mention the absence of Uriah Heep. Your right Byron, I could have included the two albums that PG/LK/BD did together, but I went with the TA/RS route through MARS into Whitesnake, as that was the closer connection to DP (obviously through DC). If I had added UH, they produced a lot of albums through a changing line-up themselves and so I would have wanted to include them all, and like I say where do you stop? Sometimes it’s a judgement call. Another judgement call was to include LZ/Y. They don’t connect to much, I agree, but, I had the right sort of space in the right area (!) of the tree, and, DP/BS and LZ are often referred to as the ‘unholy trinity’ of the start of rock music, so with that as the tenuous connection, I got them in there. Some of the logic in the poster, to determine the band line up for an album or time period, is complicated I confess, but it all works and is kind of a nice puzzle to work through in places. The use of the bracketed dates is to show when a line-up changed by use of a ‘repl by’ notation on the chart. The key tries to explain this. To the guy, who’s name has letters that are not on my keypad (! ), referring to WS errors. Again, I point out, the poster is based on studio album line-up’s. CP may have left the band early 85, but the album he was on was produced in 84. Similarly, I agree VC was with the band in 87/88 but did not appear on a studio album, this was SV and so to represent that he was the guy on the studio album produced in that period, I used the whole period for continuity. A bit of artistic licence perhaps! Keith Livingston, not sure what you’re asking me mate? Anyhow, thanks for your comments, I will look out for more! This is incredible. Thank you so very much! A member of the “Jungle” just had a heart scare,yet no mention @ THS. Get well soon,Joe Lynn Turner. Yes, Joe Satriani did not appear on studio album. But Mark 8 was with Joe Satriani – Gillan, Glover, Lord, Paice, Satriani. Also to include Janick Jers of Iron Maiden, who was the guitarist for Gillian on a couple of his solo albums. And to mention Tony Iommi with Gillian on his project for the aide in Africa. Well done Mr Glenn Wellard for an amazing effort. The principle of being in family tree should be based on a recorded studio album and not based on guest appearance either on stage or on an album. That’s why Ian Gillan was wrong to include Joe Satriani as part of DP family members in his rock and roll hole of fame acceptance speech. For example joe Bonamassa played live with DP so does this make him part of the family tress. How about Ritchie Blackmore live band members are they now part of the DP family tree. But that’s not taking anything away from your effort. It’s only my opinion. I still can’t see how the Scorpions are connected.Please help. @23 mike Whiteley, yeah, noted…. but I previously commented on JLT’s heart problem in the for the love of borscht posting…. Round & round & round we go…. (when or) where we stop, nobody knows!. You’ll excuse me now, for I must climb into the fish tank & sing… can somebody please loan me a bucket?. What about Glenn Hughes band doing mk 3 shows now and Black Country Communion ? @20 Glenn Wellard, thank you for your work, much appreciated. Jimmy Barnes introduces a whole new line including Cold Chisel, legendary Australian rock ‘n’ roll band. Vivian Campbell recorded with white snake and re recorded the single give me all your love. SV did the later album sli p of the tongue not ’87. That album was john Sykes as main guitarist. Saints and sinners had both Mel galley and Bernie Marsden on it. #28-BR: I usually skip stories about the current Rainbow,so I missed your post. I thought that JLT’s scare should warrant a thread of it’s own here.It made other music sites.No matter,it’s old news now. 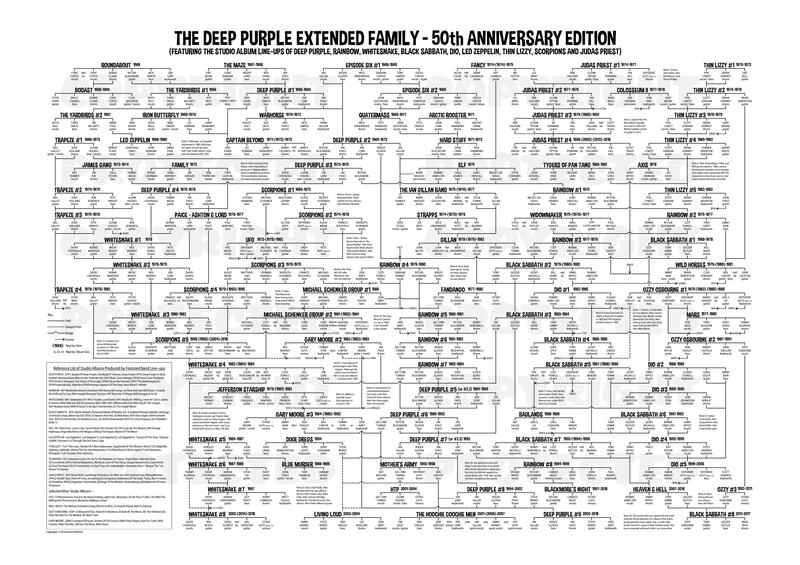 The Deep Purple Family Tree TV Special from 1995 was an excellent synopsis. Hi, I’m back again to answer some more comments! Arctic Monkeys! Where did that come from? I must have had a brain freeze on that one when I typed it in and through the whole checking process. Thanks for pointing it out, it’s now corrected. Scorpions, now there’s an awkward one! Basically, they’re in there as they’re a band I like (together with UFO and MSG). But, Don Airey played with MSG, as did Cozy (Rainbow/WS/BS et al) and Graham Bonnet (Rainbow). So the main thread back here from MSG is Schenker himself, who of course started with Scorpions, then UFO. Also, I felt since DP were very popular in Germany it was appropriate, and has no-one ever heard of the album Deep Purple vs Scorpions – The Battle of Rock!! Lol. On to Paul Anderson’s comments on WS. VC did record the guitar solo for the single Give Me All Your Love, but not on the album, so that’s why I didn’t include him. You’re right SV was on Slip of the Tongue not 1987, but that’s how I’ve shown it? WS#5 is 1987 and W#6 is SotT where SV is shown. You’re right that Mel Galley did appear on Saints and Sinners, but only with backing vocals as he only joined the group at the end of the album’s recording. So, I chose not to include him as a main instrument player in that line-up (Sorry Mel). But I agree Paul, it is a minefield sometimes, and so I’ve had to use a bit of interpretation judgement in places! @35 mike whiteley, yeah, I’m a bit sad about the way JLT gets dissed on this website by so many… He’s a great writer, guitarist, singer & live performer. He deserves respect. Of course he’s in a different league or category from people like Gillan & Coverdale. He’s from New fkn Jersey for Christ’s sake. Totally different mindset. But has anyone seen/heard his live work (on the internet) with Fandango & the late Rick Blakemore?… Brilliant stuff!.. Some of his songs are a bit twee, but overall, I wouldn’t change Joe for anything. I’m glad he was in Rainbow & Deep Purple. Smiles to ya. BR @39. I totally agree. Way too much dissing goes on here on this website about JLT, Glenn Hughes and certain others of the extended Purple family. Anybody who is part of this particular family musical deserves lots of respect as they are part of an elite group of musicians whose co-band members (ie: Purple &/or Rainbow and others) certainly saw their talent and potential. No, JLT is not Ronnie James Dio and what is wrong with that? Both men had their own unique styles which worked well within the parameters of what Ritchie Blackmore was wanting to achieve with Rainbow in those particular, distinct eras. Due credit must be given to JLT for his significant contributions to the Rainbow legacy. And, if none other than the supremely musically gifted Ritchie Blackmore saw JLT’s talents and qualities, who here commenting on this here website is qualified in any way to question that?? In my estimation, JLT is one of the most melodic of hard rock singers in the past 30 to 40 years. His phrasing and tunefulness were superior to most. Only Steve Perry of Journey and Lou Gramm of Foreigner were on par or better than JLT. Great work. But I can’t see Iron Maiden. Maiden guitarist Janick Gers had played with Gillan. rock musicians, because Mr. X had met Mr. Y one time in life many years ago and they said hello to each other. The whole thing is ridiculous, wasted time. @ 41…….Bruce Dickinson played with purple for the project of Jon Lord……and it was recorded. The poster is based on studio album line-ups only. So although Cozy left in 85, as you say, the album he played on was released in 84, which is why I ended this iteration of the band then. Similarly I agree VC was with the band in 87/88 but did not appear on a studio album, this was SV, and so to represent that he was the guy on the studio album produced in that period, I used the whole period for continuity. Is JLT in there with Mothers Army incl people like Carmine Appice(Vanilla Fudge was a big inspiration for DP)and Bob Daisley(Rainbow, Ozzy, Black sabbtha, Gary Moore)? @46 Stevie Ray Vaughen played guitar on all of David Bowies last dance album in 1983. An amazing piece of work, well done mate.